I bought quite a few (20ish) cans of "Dunn's River" coconut milk from Asda but it was a few months ago. 50p a can. Ingredients are coconut meat extract, water! I also buy Dunn's River, at tesco - 50p for a can. Caribbean products shelf. coop also sell for 55p. I like it for cooking, but its thin (no guar gum) so not so great on berries. Funny this thread is kickin, I was just googling for Dunn River coconut milk nutritional breakdowns, as the can didn't have any. Wanted to see if it was primal, and for 55p it sure is good. Just had a salad bag and coconut milk shake, lovely! I used to buy coconut milk in a purple can with a dragon on it and it was a lumpy pain. Dunn river is well....more like milk and is much better imo. Buy Biona's brand. It's something like £1.20 for 400g. Organic etc. I buy all my coconut produce from them, oil aswell. You can get it from Planet organic(Essex road or Torrington place) or Whole foods as far as i know. I get Blue Dragon full fat. I've had Dunn River before, quite recently, but it was thinner than what I expected. Made me think it was watered down (that, and the lower price). I like the thick creaminess to the Blue Dragon stuff. Worth the extra money imo. Doesn't the Blue Dragon have thickners though? Ingredients: Coconut Extract (56%), Water, Stabiliser: E466, Emulsifier: E471, Antioxidant: E330. Do you know how that compares to the Dunn River one? The Dunn River cans are only 80p at my local health food shop, as opposed to £1.30 for Blue Dragon - and that's at the bigger stores. I'll switch to Dunn River if it's good stuff. Would like a way of thickening it though, gives it a feel of quality.. I'd love to find one which is without gum! I can get that locally so will give it a go, Thanks! 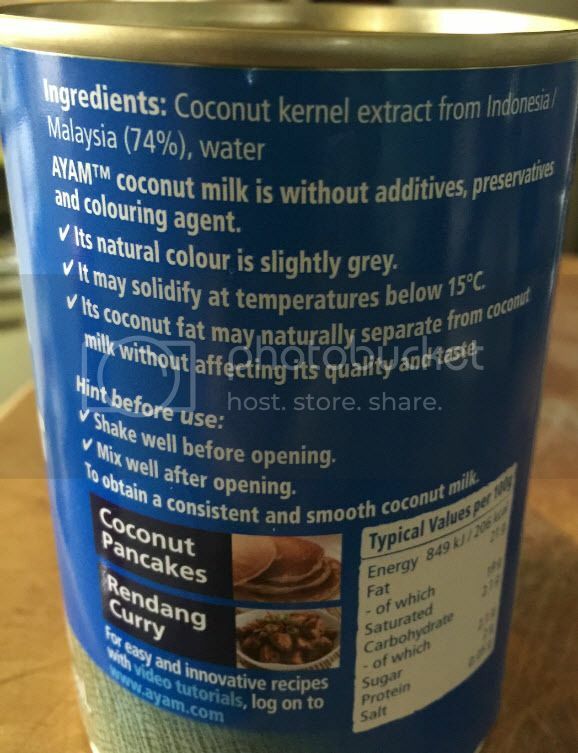 Great, it's pure coconut milk as well absolutely nothing added. Oh also Milly it gets marks approval on his site! I thought I would add this brand of Coconut milk, I buy it for £1.19 per tin and it's been very good so far. I have attached some photos for information. I get it from my local Oriental/Asian store when they have a BOGOF promotion. Last edited by Changy; 12-04-2015, 04:43 AM. Thanks for that! I shall look for it!